As I continue to look at the Olivet Discourse and futurism, we are seeing that if part or all the events prophesied in Matthew 24:4-12 refer to the inter-advent age—which is the current church age—then imminency is impossible. Yet, all pretribulational rapturists believe that the New Testament Epistles teach us to look for Christ Himself, which indicates that no event or series of events must occur before Christ can come in the clouds and take His church with Him to the Father's house. Let's take a look at imminency passages. "Let not your heart be troubled; believe in God, believe also in Me. In My Father's house are many dwelling places; if it were not so, I would have told you; for I go to prepare a place for you. And if I go and prepare a place for you, I will come again, and receive you to Myself; that where I am, there you may be also." "For they themselves report about us what kind of a reception we had with you, and how you turned to God from idols to serve a living and true God, and to wait for His Son from heaven, whom He raised from the dead, that is Jesus, who delivers us from the wrath to come." The wrath spoken of by Paul must surely refer to "the day of the Lord" (2 Thess. 2:2) or the wrath of the tribulation (1 Thess. 5:3, 9). Thus, believers will be delivered by Jesus, (through the rapture), from future wrath (the tribulation). Brindle notes that, "the statement points to a deliverance before wrath begins." This passage speaks of an imminent return. "But you, brethren, are not in darkness, that the day should overtake you like a thief; for you are all sons of light and sons of day. We are not of night nor of darkness; so then let us not sleep as others do, but let us be alert and sober. For those who sleep do their sleeping at night, and those who get drunk get drunk at night. But since we are of the day, let us be sober, having put on the breastplate of faith and love, and as a helmet, the hope of salvation. For God has not destined us for wrath, but for obtaining salvation through our Lord Jesus Christ,"
"so that you are not lacking in any gift, awaiting eagerly the revelation of our Lord Jesus Christ." The Corinthian church is instructed by Paul to focus not on spiritual gifts, but on the return of Christ. They are "awaiting eagerly" His revelation, which supports the notion of imminence. If one is "awaiting eagerly" something, it is the entire focus of their expectation, which could not be the case if events were to precede Christ's revelation. "looking for the blessed hope and the appearing of the glory of our great God and Savior, Christ Jesus." Paul's terminology here strongly implies that "the blessed hope," as the Christian's ultimate hope, is the rapture presented as a totally positive and joyful expectation." Surely this would not be the case if one were destined to go through the events of the tribulation. There would be a dread, because in order to experience the happiness of Christ's return, they would first have to endure the pain of tribulation. This is not the case at all in this passage. Believers are to be looking for an imminent appearing of their Savior, Christ Jesus, not signs or events that must precede His appearing. "Beloved, now we are children of God, and it has not appeared as yet what we shall be. We know that, when He appears, we shall be like Him, because we shall see Him just as He is. And everyone who has this hope fixed on Him purifies himself, just as He is pure." 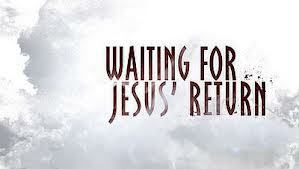 "And behold, I am coming quickly. Blessed is he who heeds the words of the prophecy of this book" (22:7). "Behold, I am coming quickly, and My reward is with Me, to render to every man according to what he has done" (22:12). "He who testifies to these things says, 'Yes, I am coming quickly.' Amen. Come, Lord Jesus" (22:20). On the other hand, the Olivet Discourse tells believers to watch for signs and to "endure to the end, he shall be saved" (Matt. 24:13). Church age believers are told to wait, not watch, since there are no signs preceding the "any moment" or imminent rapture event. These are two separate events. Thus, if there are signs of Christ's coming throughout the Church Age, especially toward the end, then it leads to the clear conclusion that there cannot be a pre-trib rapture before the tribulation or the concept of imminence must be totally redefined, as many posttribulationists have done. Instead, it is better to apply consistent futurism to the Olivet Discourse and see all of the events of verses 4-31 as occurring within the 70th week of Daniel, not in any part of the current Church Age. Maranatha! Wayne A. Brindle, "Biblical Evidence for the Imminence of the Rapture," Bibliotheca Sacra (April–June 2002; vol. 158, no. 630), p. 139. Brindle, "Imminence of the Rapture," p. 139. Brindle, "Imminence of the Rapture," pp. 139–51. Brindle, "Imminence of the Rapture," pp. 141–42. Brindle, "Imminence of the Rapture," p. 143. Brindle, "Imminence of the Rapture," p. 148. Brindle, "Imminence of the Rapture," p. 149. W. F. Arndt, F. W. Danker, F. W. Gingrich, & Walter Bauer, A Greek-English Lexicon of the New Testament and other Early Christian Literature , 3rd ed. (Chicago: University of Chicago Press, 2000), p. 993. Brindle, "Imminence of the Rapture," p. 151.